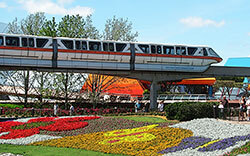 It’s hard not to love the look of Disney’s Monorails. Especially when they do something special like redo one of them with a Tron theme! Enjoy our Monorail wallpaper!